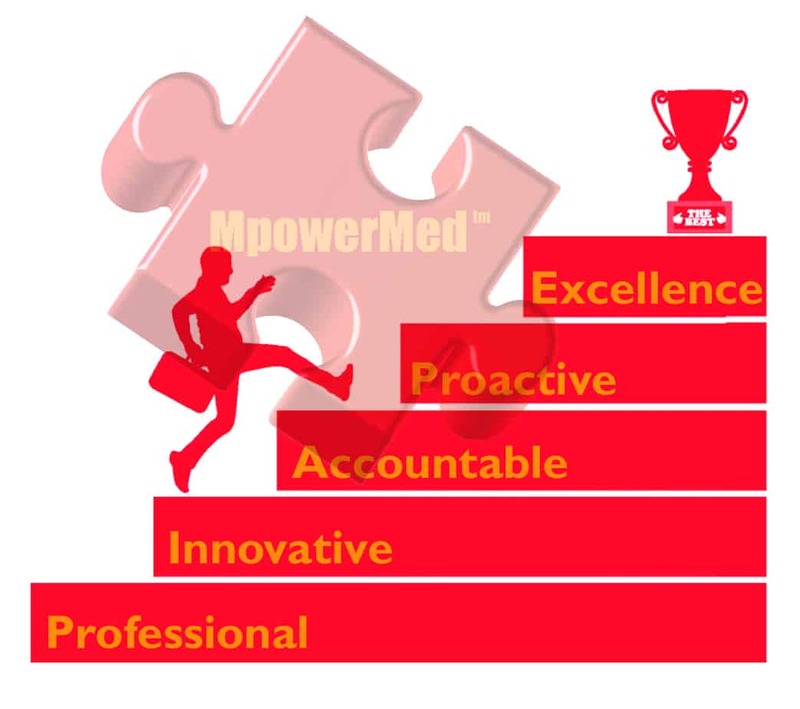 MpowerMed’s mission is to provide innovative value added superior results and business solutions for healthcare professionals, medical practices and healthcare providers. Our vision is to enhance their practice management, efficiency and profitability and be a trusted and a solutions oriented partner. We are passionate professionals, and foster a culture that demands integrity, respect, teamwork and professional growth. Our clients make important business decisions about their medical practices with the information that we provide. It is our responsibility to furnish data that is accurate, current and will ultimately assist our clients in providing better service to their patients. We hold ourselves accountable for delivering on our commitments to our team members and our clients. Each member of our team is accountable for their individual decisions and actions to ensure that their contributions maintain a successful and long-term relationship with our clients while reflecting positively on our company as a whole. Our relationships with our clients are forged with trust and mutual respect. We earn our clients’ trust by preserving the highest ethical and professional standards, treating each client as if they are our one and only client. We recruit talented professionals who share our commitment to achieving quality service. By facilitating an environment of continuous learning and self-development, we enable our professional team to continue to be the best possible resource to our clients. We establish partnership with our clients with open and honest communication where we listen to and learn from our clients. The amalgam of our in-depth experience in the healthcare industry and our understanding of our clients’ needs with regard to daily business operations produce a long-term solution that will exceed their business challenges. We feel very strongly that an active local community presence makes our business more of a success because it not only allows us to give back; it increases our awareness of the significance of patient education and satisfaction.